Octopuses are widely regarded in the scientific community as intelligent and playful cephalopods. Much about their level of awareness, the extent of their intellect and their day-to-day habits remain a mystery to marine biologists and aquarists. While basic questions -- how do octopuses breed, how do octopuses feed -- have been answered in detail, there is much study being conducted on the implications of the sleeping octopus. Until recently, scientists believed that only vertebrates experienced what is known as "metabolic sleep." Invertebrate sleep has been tricky to define, given the complete difference in physiology between them and vertebrates. When brainwaves of invertebrate sleep were recorded, the results were "spiky," unlike the "wavy" sleep brainwaves of vertebrates. For vertebrates, there is the slow wave pattern of deep sleep and the brainwave intensity and rapid eye movement of REM sleep. Humans go through cycles of slow waves and REM sleep; alternating between deep restful sleep and dreaming. Cephalopods -- and in particular, octopuses -- have been found to have very similar wavy brainwaves associated with REM sleep. These brainwaves also indicate that octopuses go through sleep cycles, much like humans and other vertebrates. Octopuses, domestic and in the wild, will crawl into their homes, narrow their eyes, and remain still for long periods of time. Every once in a while, for about 15 minutes, they will rapidly change color and twitch their tentacles. Scientists once thought they were hyper-vigilant -- waking to check on their surroundings -- but now believe this movement is evidence of REM sleep. So what does it mean if octopuses are experiencing REM sleep? In humans, REM sleep is the indication that we're dreaming. Vertabrates display REM sleep with rapid movement of the eyes, relaxed muscles and frequent brain activity. In adult humans, REM sleep takes up about 20 to 25 percent of the time spent sleeping. Perhaps most importantly, REM sleep enables the brain to perform complex problem solving and boosts creative output. In short, dreamers can actually learn from their dreams. By all indications, when octopuses sleep, they're also dreaming. If humans and vertebrates can learn from their dreams, does that mean octopuses are also learning from dreams? Scientists who study dreaming and REM sleep believe that dreaming lends an infinite array of possibilities to the mind, forcing it to "reverse learn" by solving problems it may never encounter in real life. So, not only do octopuses sleep, they (uniquely for an invertebrate) may also sleep very much as humans do, learning and dreaming in much the same way. 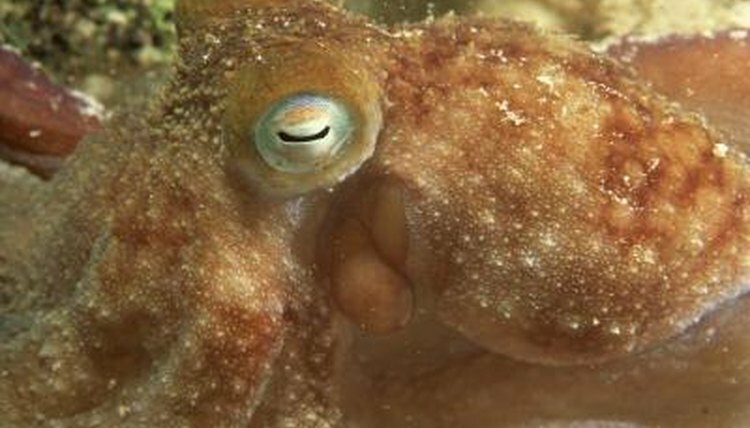 UC Davis Idea Lab: What Lurks Beneath the Depths: Does Cephalopod Consciousness Exist? Why Does a Blue Whale Have Small Eyes? How Is a Dolphin's Eyesight? How Often Do Hamsters Usually Sleep? How Fast Does an Axolotl Swim?